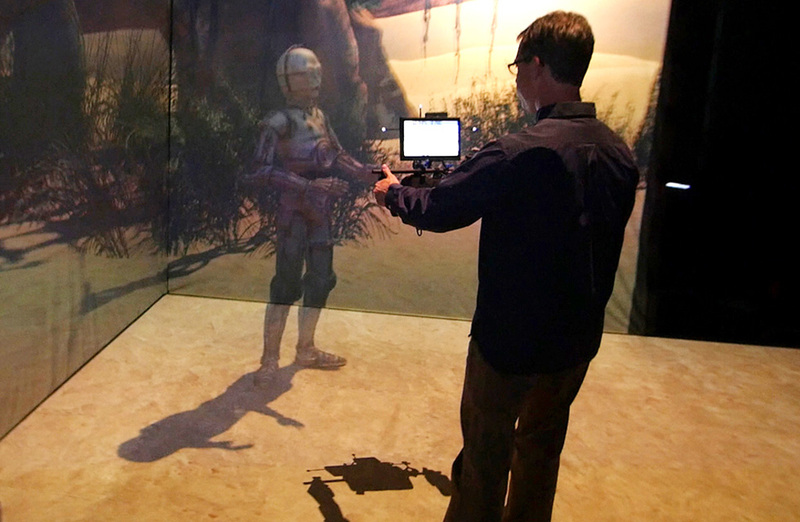 ILMxLab's holographic tech lets you reach out and touch C-3PO. Virtual reality found itself front and center of Utah's wintery celebrity village earlier this year, virtually dominating the conversation around this past Sundance Film Festival. The technology, a burgeoning new medium for artists, game developers, filmmakers, and journalists alike, had reached a cultural tipping point, with the Park City fest playing host to the announcement of a dedicated VR animation studio from Facebook-owned Oculus VR and ten VR projects that stole the headlines from Sundance's edgy, experimental New Frontier showcase. "Last year was one of those historic moments where it was like the perfect storm," says Shari Frilot, chief curator of New Frontier's VR-heavy 2015 showcase. "Not only were there significant developments in the technology and a commitment by storytellers, content creators, filmmakers and journalists to grasp onto it, [but] there was also this ramping up of industry -- manufacturing, as well as kind of peaking of interest in more mainstream content creators. That all converged at the festival in a way that was really explosive. ... That's sort of the unicorn that came out of New Frontier." That New Frontier, now celebrating its tenth year, served as VR's mainstream coming out party is no surprise to Frilot. But despite the buzz and fanfare around last year's deliberately VR-focused exhibit, Frilot maintains the spirit of New Frontier hasn't changed and that it's not solely a showcase for that emerging tech. "As big as this has gotten, it's still the same nerdy project," she says. "Hopefully, we've built an architecture in this exhibition that will not lead people to say, like they did last year, that VR took over the Sundance Film Festival," says Frilot. 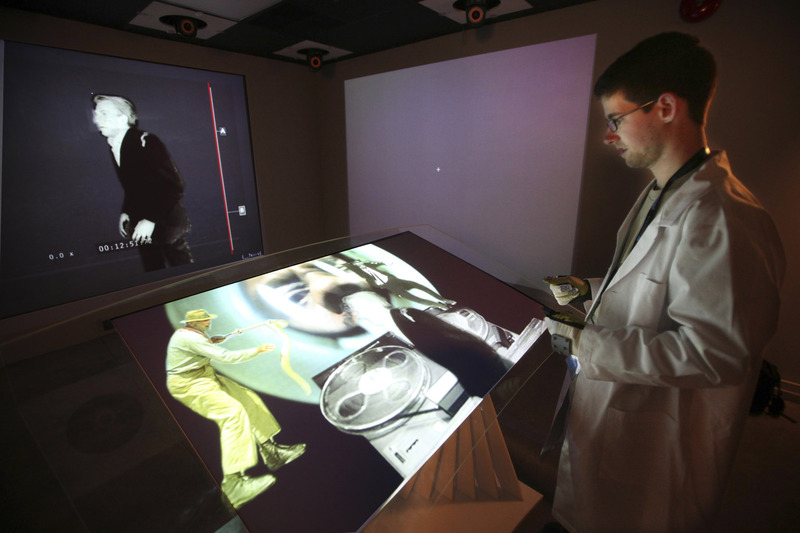 The exhibit, which made its festival debut in 2007 on the heels of the Web 2.0 evolution and its convergence with the art world, was always intended to be an experimental showcase for (often controversial) works that push the boundaries of storytelling using bleeding-edge technology. Frilot cites early works like Ricardo Rivera's patented video-mapping technique from New Frontier's inaugural year, which he used to project images onto furniture, and Nonny de la Pena's immersive VR journalism project from 2011 -- for which Oculus VR co-founder Palmer Luckey served as an intern -- as examples of the exhibit's open-minded, future-forward spirit. It's a dressed-up media lab, in a sense -- a theme that will be showcased conspicuously for its 2016 run. "Tamper" Tom White uses his hands to direct images on a video board at 2009's New Frontier. "Hopefully, we've built an architecture in this exhibition that will not lead people to say, like they did last year, that VR took over the Sundance Film Festival," says Frilot. "But hopefully, they will say that VR is a vital part of Sundance and other things are still happening, still developing. There's still a vital and very rich experimentation at New Frontier that points to a future that we have not seen yet." Of the 30-plus VR works planned for exhibition in January, several incorporate the tech as only a facet, merging it, instead, with elements of augmented reality, haptic input (i.e., the perception of touch), room-scale projection (Valve's lighthouse tracking) and even sculpture. Three projects in particular -- one of which hails from Lucasfilm's ILMxLab, another counts Intel as a partner -- are set up less like installations or finished pieces and more like actual media labs where the scientists will be on hand to discuss the technology behind their works and, essentially, evangelize its promise. "It's a nerdier engagement than entertainment, but I really believe in this," says Frilot, "because what I want to do is bring these great storytellers together with these really brilliant scientists that are innovating the form." An augmented reality-whale flies over audience members in The Leviathan Project. The Leviathan Project, based on the science fiction novels by Scott Westerfeld, is one such meta media lab project that melds VR and AR tech. Participants wearing VR headsets are placed inside a virtual lab situated in the belly of "massive flying whale" and, using positional tracking, are able to interact with surrounding virtual objects. Then, once they've exited the VR headset experience, they can watch as the AR-whale flies off screen and into the physical New Frontier space. As for ILMxLab's The Holo-Cinema, which is structured similarly to The Leviathan, Frilot says the content of that experience hasn't quite been locked down -- she plans to visit with the team soon to cherry pick which of the lab's many projects will be shown. "Part of what they're working on are VR experiences," explains Frilot. "Part of what they're working on is kind of an AR-like experience where AR/holographic ... characters are coming at you[.]" Apart from the human-scale holographic and AR projects under consideration, there's one ILMxLab tech attendees can count on experiencing: a virtual camera. "We've built a kind of independent platform that respects what VR is, what it looks like on the emerging marketplace, and [how you can] really engage with that in a serious way," says Frilot. The tech, which allows directors to frame virtual shots, is the kind of technology that Frilot believes will have a significant impact on New Frontier's community of artists, technologists and filmmakers. "That's definitely going to be there," she says. "That's an enormous tool, a huge tremendous tool for filmmakers to really ramp up their practice. And [ILMxLab's] really excited about sharing that." Though projects designed for established platforms like Google Cardboard (a repeat of last year's giveaway is planned, this time with a special 10th anniversary New Frontier edition), Samsung Gear VR, Oculus Rift and HTC Vive will have a presence at the exhibit's core experimental space, Claim Jumper, works built for Sony's PlayStation VR will not. Instead, Frilot says the company will have the chance to showcase its work at The Gateway, a venue dedicated to to currently available VR experiences. It's also a separation that Frilot admits is intended keep the conversation around New Frontier focused largely on its original, experimental mission. "We've built a kind of independent platform that respects what VR is and ... what it looks like on the emerging marketplace, and [how you can] really engage with that in a serious way," says Frilot. "But doing it in a way that's independent of what originally we were setting out to do at New Frontier, which is to create a safe, interesting, nourishing space for experimentation." 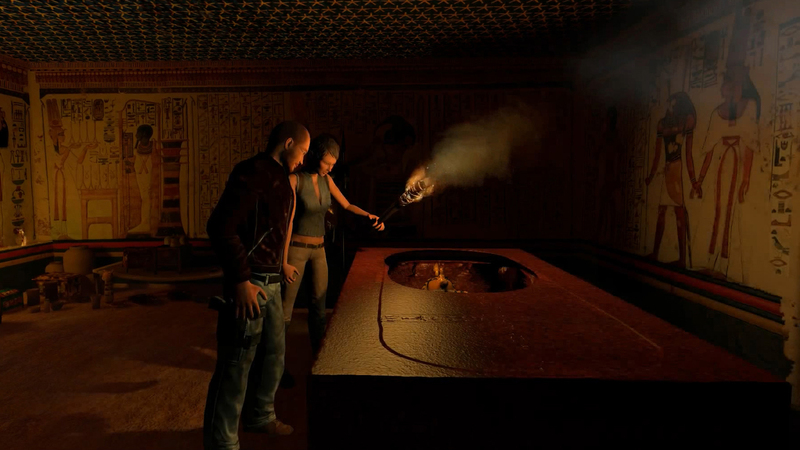 Real Virtuality: Immersive Explorers, a project planned for 2016's New Frontier, lets participants get social in VR to explore a crypt. New Frontier's current lineup features a mix of expected independent artists, journalists and filmmakers alongside corporate heavyweights, the presence of which may initially seem odd for the fringe exhibition. But Frilot contends this is all evidence of a "kind of equalizing moment" in time, where "everybody's doing the same exploratory work." "It reminds me of ... when it used to snow in Park City. Back then, when we used to get snow, we used to have a saying: 'Everybody slips on the ice.' Harvey Weinstein slips on the ice just like that short filmmaker slips on the ice. It feels like one of those moments right now where I can walk into xLab and see some really hot stuff and then I can walk into a small gallery in San Francisco and find a scientist working, within the academic context, on some really equally hot, exciting work." Correction: An earlier version of this article incorrectly identified ILMxLab's virtual camera software.